SWAPS I AM RESENDING AND SENDING FRIDAY 25FT OF MARCH! TAGS: Resending January wishlist Harakuja girls (babieblueeyes), cause the envie was torned so it contents got lost....It's coming you're way again my dear. TWA Winner Yunasy; i asume it didn't arrive cause i read nothing in pm or one my profile. FOR EVERYONE STATED ABOVE, I AM REALLY SORRY FOR THE DELAY BUT I HAVE NO CONTROL OVER THE MAIL. AS YOU CAN SEE ON MY PROFILE SWAPS ARE ARRIVING. IT ONLY TAKES VERY LONG, I AM A GOOD SWAPPER AND RESENDING ALWAYS EVEN WHEN IT IS FOR THE THIRD TIME AS YOU CAN SEE. I REALLY AM DOING ALL I CAN TO FORFILL MY OBLIGATIONS TO YOU ALL. Please read this: When you have not received a swap from me, please let me know and i will resend! NOTE: I never flake! And i never send late! But the traveling time to Australia and Canada is between 4 and 6 weeks i discovert. Hello, My name is Sindy and i am 31 years old. I live in the Netherlands in a city called Bergen op Zoom. I work as a nurse in a psychiatric hospital, and i'm starting a new education program to become a nurse practitioner. I'm living together with my 2 cats (Ozzie and muis) and one rabbit (Deus). I enjoy my life everyday, and what helps me when i'm feeling down is crafting and sending and receiving mail or little handmade presents. Now i am busy making my own webstore, so i'm really hard at work to create my own little store. With all my own creations in my own personal style. In the near future i would like to keep a blog but unfortunally i'm not that great with computers. COLOURS I DON'T LIKE; Brown/ yellow/ olive green. FAVORIETE KLEUREN; Roze (licht en fel)/ appeltjes groen, oranje, aqua, paars/ polkadots. KLEUREN DIE IK MINDER LEUK VIND; Bruin, geel, olijf groen. FAVORITE CRAFTS Sewing, making jewelry, scrap booking, creating new things, baking cupcakes and cookies, making memory boxes, scrapping, working with fimoclay, collecting vintage material, making and collecting matchboxes and Dotee Dolls, putting swaps together. CREATIEVE BEZIGHEDEN Naaien, sieraden maken, koekjes en cupcakes bakken, memory boxen maken, scrappen, fimo kleien, rommelmarkten afstruinen, kransen maken, bloemschikken, maken en ontvangen van matchboxes en Dotee Dolls, samenstellen van swaps. WHAT CAN I GIVE: Fabrics/ all Matrouschka things/ handmade jewelry/ sewed things (stuffed animalls, bags, pencil cases e.d.) Kawaii/ ribbon/ beads in all colours and kinds (wood / glass / acryl)/ scrap supplies/ handmade bookmarks/ polkadots/ animals made from beads/match boxes/tea/Dotee Dolls. WAT KAN IK RUILEN; Zoete stofjes/ diverse kralen/ diverse bedels/zelfgemaakte sieraden/zelfgemaakte tassen/ kussenhoezen/spulletjes om sieraden te maken/spullen/potloodtasjes/theetasjes/ genaaide druppels/genaaide potjes/genaaide knuffels/ boekenleggers/zelfgemaakte sleutelhangers/charms. WISHLIST: Fabrics (all kinds specially with sweet things / Japanese / Kawaii / polkadots / ribbon / all Matrouschka things/ beads / Dotee Dolls/ match boxes / cupcakes / handmade things (amiguri, matchboxes, cupcakes)/ Maneki Neko / Symbolic stuff/ lucky charms/ Dotee Dolls/ Gingerbread man/Starbucks coffee/ cute socks size 39/cute ladies t's size L/ Alice in wonderland especially the cat/ care bears. Learning to knit, learning to crotch, learning to work with felt. DONT'S Please send me no Disney, Diddl, Snoopy or packages that don't include a letter or card who send it or what swap it is. LIEVER NIET Disney, Diddl, Snoopy pakketjes waar geen brief of kaartje bij zit wie de maker is, of om welke swap het gaat. FLAKERS LIST; BE AWARE OF THESE FLAKERS!!!!!!!! Swap name: October is Breast Cancer Awareness Month!!! Flaked by: Taraquilt or Tara Read. She is now partily suspended, unfortunaly she never reacted to any of te messages i send to her. And i never received anything. Angeled by: ShexShay thanx a lot for angeling! Swap name: Jewelry swap. Flaked by: Shelly (michelle) Rosen - LeBret (greentrolls) She never send anything, or responded to any of my mails. On her profile it says she is a REPEATING FLAKER!!!!! BE WARE. Swap name: Halloween Matchbox - 250ct FIXED. Flaked by: Leeann Karsko (TheRiceLady). Her first swap and she never send anything or responded to me. Swap name: MEGA stickerswap Flaked by: Roxanne Landreth (msbossy) She never send anything, And now she is partilly suspended. Angeled by: Stickerlady, thanx so much for the stickers! Swap name: I love cupcakes. Flaked by: stacey sutcliffe (broadway90) She is a newbe and participated in 5 swaps, marked everything send but none of her partners have received anything. Angeled by: LauraLizzy. Thanx so much for the lovely socks and other goodies. Comment: Hello! It has been a long time but I still have not received your swap, so I have to rate you 1 according to the rule of this swap. Comment: Swap not received. PM sent; no reply. Comment: Will rerate if I ever get anything. Comment: Will re-rate if these ever arrive. Comment: still waiting never recived you said you were going to resend this swap been months. if i ever recive will rerate. Comment: I'm sorry I'm ready to change your vote if it comes, but it's still got nothing. Comment: Never received anything, nor got a response to my message I sent. Will re-rate if I receive it. Comment: I really did not want to rate you a 1 and I have tried my hardest not to but you have still not sent this item and have a long list of members on your profile waiting for their swap. I will rerate if anything arrives. Comment: Thank you so much for the great ink painting card. Let me know if you have received the cupcake dotee yet? Hi. I just want to make sure you will be sending out your swap, for OTT: Little monster, by tomorow as I have temporarily advised your partner not to send to you until you are unsuspended and until your own partner has received from you. Hopefully this will be a temporary situation and you can get back on track but for now, I do hope you understand my position and as swap host I must make sure everythign runs smoothly and fairly. 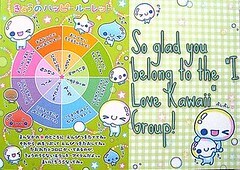 Letting you know that I have not received the I Love Kawaii - INCHIES! as of yet. I will wait until the 30th of this month, and that is when I will put my rating in. I hope you understand.